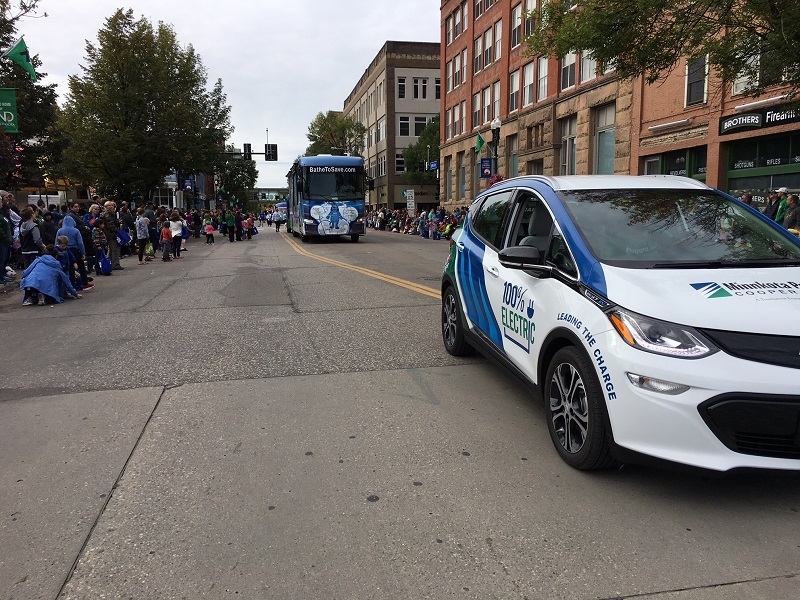 This weekend the Minnkota EV marked its fourth parade of the season, but this one was special. 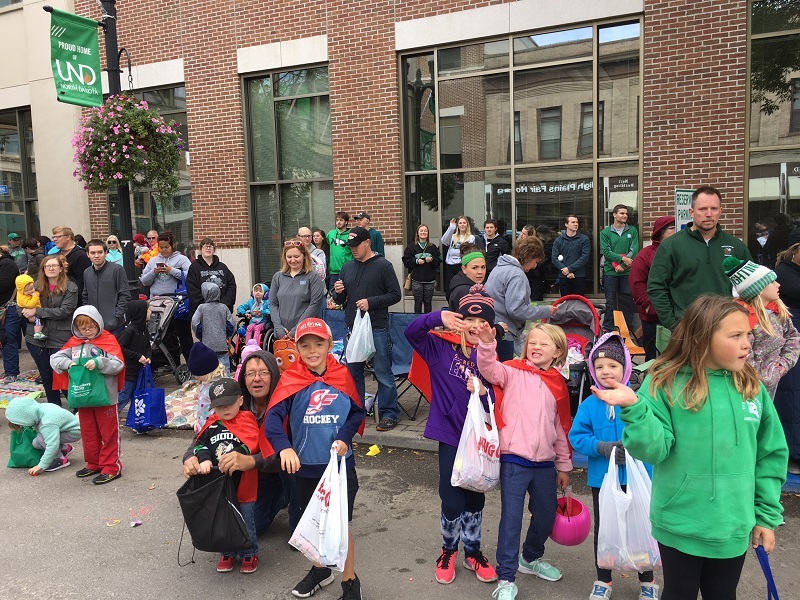 This time, we were celebrating UND Homecoming Week, which was combined this year with the annual Potato Bowl festivities – double the theme, double the fun. 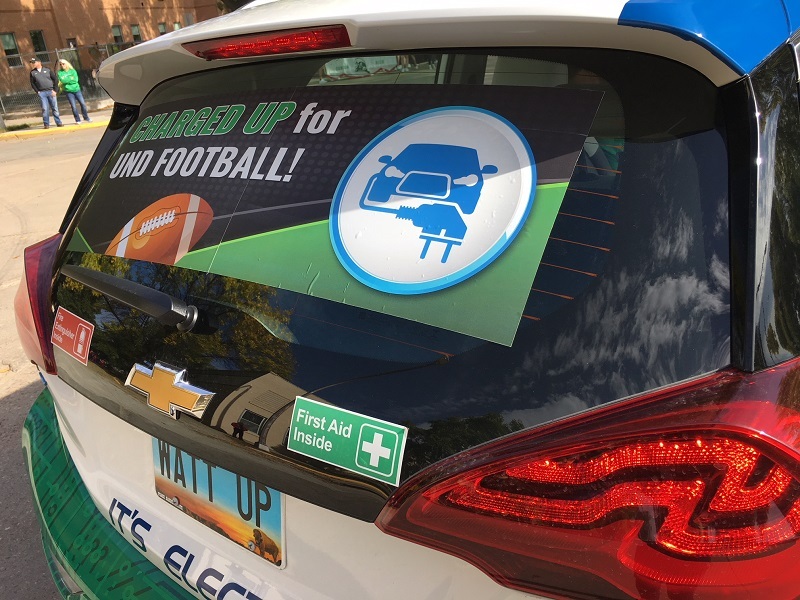 The University of North Dakota is alma mater to both me and my communications team comrade Ben, so we threw on our Kelly green, decked out the car with a "Charged Up for UND Football" window cling and made our way to downtown Grand Forks. We had a great cling printed up for the parade. A shout out to Jenna Chase for the design, Troy Ahonen for the print and Travis Jacobson for the application! We learned an important lesson while meandering through the floats and people lining up on neighborhood streets in parade preparation. This car is almost too quiet. People standing in the roadway couldn't hear us creeping up behind them, so I had to shout a few polite excuse me's from the passenger side window. Fortunately, we got into position without incident. When the parade finally started to roll, we were met by hundreds of fans packing both sides of Demers Avenue. What a crowd! I looked at our candy stash and wondered, "Is this enough to sugar the masses?" Spoiler alert: It was. 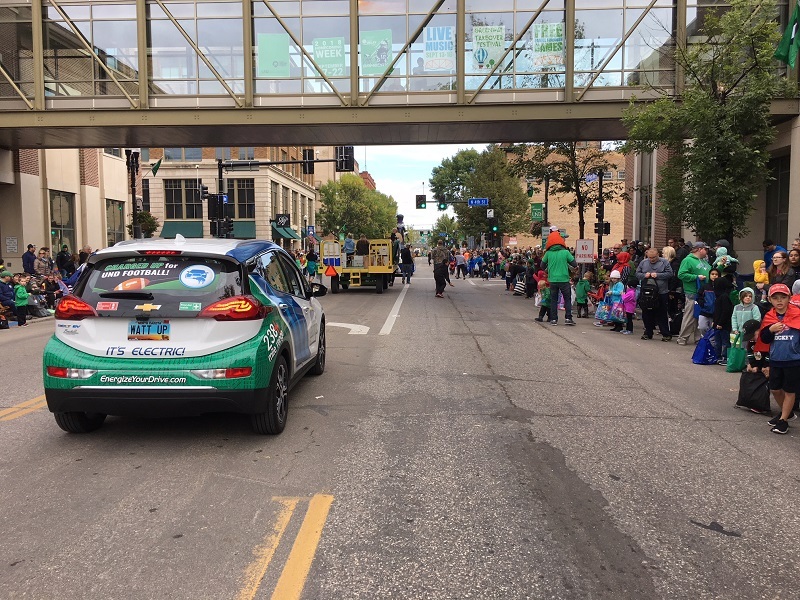 Downtown Grand Forks and East Grand Forks were the perfect setting for this community celebration of sports and spuds. Go Hawks! The parade crowd didn't let chilly weather keep them away. We can safely say thousands watched more than 200 participants pass by. The candy haul was impressive as well. Ben kept excellent pace behind the steering wheel, while I occasionally fell behind in my pursuit to get every single child a piece of candy. 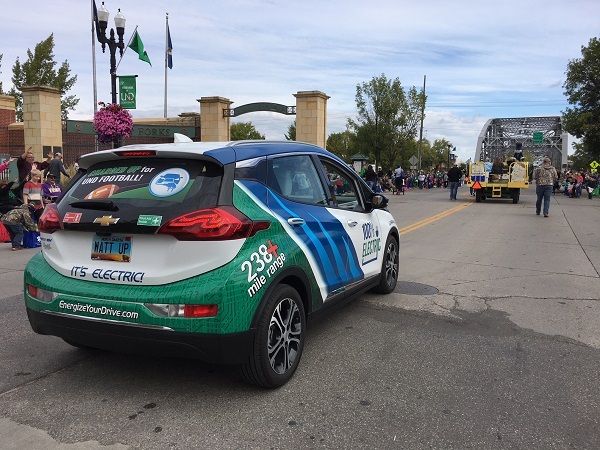 From the the driver's seat, Ben heard a lot of curious shouts from the crowd, including calls like, "All electric! Awesome!" and "I didn't even know that was a thing," and a few simple iterations of "Cool." We were definitely getting some attention, even with clowns ahead of us and a few adorable dogs behind us. The parade went by incredibly fast and I had to run to keep up with the flow, throwing candy into sacks and grocery bags like a sniper. After a few city blocks of sprinting and peppering families with Snickers, Starbursts and Skittles, my personal battery started to wear down before the Bolt's (maybe I need to install some regenerative braking in my sneakers...). It felt amazing to connect with our community for such a special event. Minnkota thanks the Kem Shriners for allowing us to participate!